Beautifully Renovated 540 Sq. 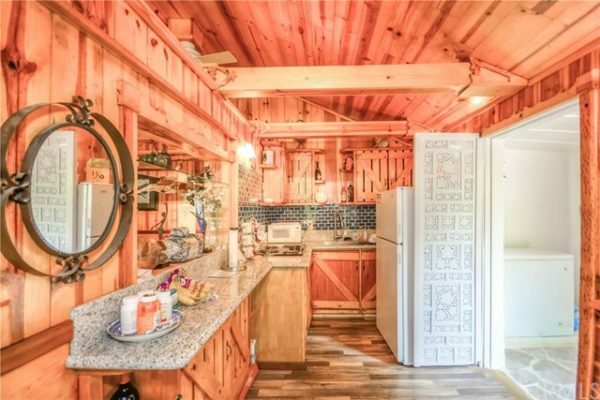 Ft. Cabin in Lytle Creek, CA For Sale! This is a 540 sq. ft. tiny house on a 10,435 sq. ft. lot in Lytle Creek, CA that has been completely remodeled. You can see the before photos here. It is listed for sale on Estately for $199,000. I really enjoy reading everyday the Tiny House emails. I’m not a fan of Tiny house on wheels (just a fancier trailer). I really like the one that are permanent structures. But the prices are over the top. This one is list for $200,000. The purpose of a tiny home is you remove some of the financial burdens that always come with home ownership. I know land is expensive in CA. This subject needs to be revisited and only list homes that are within a Tiny House person’s budget. Nothing over $80,000 and that is still high. Hi Dan thanks for the feedback – I’ll be on the look out for more affordable small house properties to share! Thanks. Full life, inside and out. the remodel interior does not deliver. Totally agree… original, while not great, was infinitely better than the new interior. While I liked the green exterior I was torn between that and the original exterior. Beautiful. A quarter of an acre. The price seems reasonable to me. I love the dragon. Thank you so much for this. I grew up next to Lytle creek. To me this is overpriced. Too close to the main highway as you can see from the pics. Too many people going up to the mountain and trashing it. Not a desirable location at all. That being said I love the burst of color inside! Thanks for the insights Julie! It’s nice but I can’t wrap my head around $200 grand for Lytle Creek. However, you do get a dragon in the deal, so that’s something. What’s the deal with the cartoonish pics for some homes? They have the look of an artwork and it is actually distracting. I work full time in real estate and have for many, many years. I would never make use of such pictures for my properties. Just commenting in case a change is possible. The cartoon photos are not an asset. The renovation was garish and odd use of floor space. They will most likely be ripped out by next owner. Price probably reflects commercial zoning Too close to road to be relaxing. Next post: Man Builds 145 Sq. Ft. Tiny Home to Escape Corporate Life!